Descendez de votre ascenseur privé directement dans plus de 3 000 pieds carrés de luxe avec une vue imprenable sur le golfe du Mexique, la baie de Turquie et le parcours de golf Old Collier. Votre golfe vue caractéristiques ciel villa décorateur finitions, y compris le mobilier en passant élégant, pour satisfaire les visiteurs les plus sophistiqués. Comme nos clients, vous bénéficierez de toutes les commodités d'un hôtel de classe mondiale, y compris l'accès au membres seulement Floridian Club, un club de plage privé directement sur le sable blanc de Vanderbilt Beach avec la nourriture délicieuse, des cocktails, une piscine d'eau douce étincelant, et les préposés à mettre en place vos serviettes chaise longue, parasol et plage. De retour aux Dunes, vous aurez le choix entre deux autres piscines - une sur le niveau de la terrasse de votre condominium ou la piscine du complexe géant. Ici, vous pourrez dîner en bord de piscine au Tiki Bar ou de l'échantillon tarif de la salle à manger Plantation Club. La cuisine, avec comptoirs en granit, réfrigérateur en acier inoxydable de 42 pouces, cave à vin et cuisinière à gaz, est parfaite pour préparer un repas gastronomique ou ouvrir un contenant à emporter dans l'un des dizaines de restaurants à proximité. La vie est facile avec une télévision à écran plat, laveuse et sécheuse, et un accès internet wi-fi. Détendez-vous et profitez-en! Remarque: toutes les locations sont soumises à l'approbation de la Property Owners Association et nécessitent des frais de demande de 350 USD et des frais de vérification des antécédents de 40 USD. Les locataires internationaux exigent des frais de vérification des antécédents de 100 $. Les locations de moins de 30 jours sont autorisées; toutefois, les locataires doivent remplir un contrat de location de 30 jours pour satisfaire l’association des propriétaires. Une seule location est autorisée par période de 30 jours. We were fortunate to have spent the month of February in the Dunes Grande Phoenician and wish we could have stayed longer! The beautifully decorated unit was comfortable, spacious and well-equipped with everything we could have possibly imagined including an elevator that opens up directly into the 11th floor apartment! The mostly unobstructed views of the Gulf were spectacular and the building pool as well as the large community pool area with food and drink service were very convenient. We also opted to join the "Floridian Club" on Vanderbilt Beach, another perk of renting at the Dunes. Transported by a shuttle from our building, we could go for a day at the beach, cocktails at sunset or a nice meal always provided with excellent service. Our family joined us from the Michigan freeze for a long weekend and everyone ( 3 adults and 4 children) had the best time with all the amenities provided at the Dunes. The Weinbach family were great people to deal with and you won't find a nicer place to stay! Jay, so glad you and your family enjoyed your time in Naples and at our condominium at the Dunes. We will keep the sun shining for your next visit! I'm an extremely picky traveler & after 17yrs vacationing in Naples, we've had our share of places that were very sub-par. This condo was perfect! Slightly modern, but cozy, TWO Kings beds (which is hard to find), fantastic location, gorgeous views, very large/spacious, clean & overall just top notch. Dan and his family are fantastic. They answer emails promptly & really cared about making our stay easy & enjoyable. Trust me, having owners that you feel comfortable renting from is VERY important. They were by far the best people to work with. The Floridian Club was the best beach experience we could have asked for. The shuttle comes twice an hour right outside the condo & you don't have to lug around beach towels or chairs, they provide it all. It's like a mini resort with full service of drinks & food right on the beach-worth every penny. LOVED IT! The condo is located near everything you need. Besides the shuttle, the beach is within walking distance or you can rent a bicycle from BeachBum rentals which will drop off & pick up right at the front door of the condo. We couldn't have asked for a better trip & for the 1st time in a long time, I hated to come home. I HIGHLY recommend this condo & we hope to rent here again. 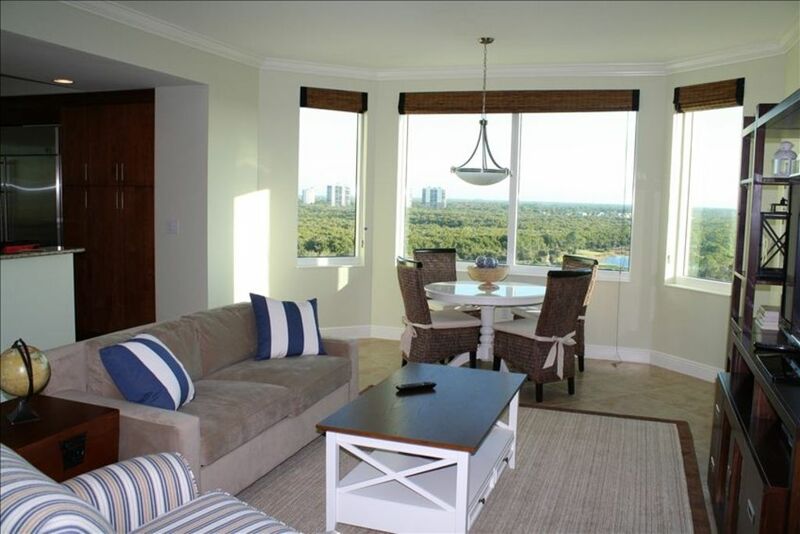 Beautiful condo with amazing views and ammenities! This is a beautifully decorated and very spacious condo! Very private and secure as well! Beautiful beach club access, and great amenities like well-equipped gym and and lovely bbq area. Nice people and beautiful beach! Overall great experience! We love Naples and this condo! We have rented this upscale attractively decorated and accessorized, comfortable, immaculate condo in a great location for two seasons and look forward to doing so next year as well! The owners are fabulous about keeping this Naples property in great shape and quickly and kindly taking care of anything that needs attention throughout our 3 month stay! The Dunes complex is wonderful ( excellent restaurants, exercise facilities, etc. ), the concierge and dining staff so lovely and helpful, and the beach club is heaven! You would be lucky to spend some time in this condo enjoying the sunset views, the ambiance, and all of the fantastic amenities Naples has to offer! Be sure to visit Royal Scoop, favorite restaurants on Third Street South and Fifth Avenue, and Mercato with Silverspot Cinema and the also close by Pavillion Cinema. All in all a dream of a getaway! Any visiting family and friends will be comfortably accommodated and love it right along with you! We rented this condo for 2 months and throughly enjoyed our stay. From the minute the elevator door opens into the condo you know you're in for a treat. The condo itself is very spacious & immaculate and the owners have put a lot of thought & effort into choosing high quality comfortable furniture as well as accessories & amenities, also well stocked kitchen, towels & bedding. It was our home away from home and the stay was a very pleasant experience. The Dunes location is excellent, we thoroughly enjoyed the restaurant, tennis and resort pool and of course the close proximity to the Gulf of Mexico. While our property association requires a 30-day lease, we have the flexibility to book shorter stays -- sometimes as short as one week. However, renters must pay the property association's application fee of $350 and a $39 background check fee. In addition, you will be required to sign a 30-day lease. Of course, the rental fee will only reflect the duration of your stay, i.e. the rate corresponds to the shorter-length stay, not a 30-day stay. For more information, contact the owner.